Hi, I was wondering what is meant exactly by ‘approved post-secondary school’. I might go back to EU in the next 10 years, so I wasn’t sure what’s needed as proof of education to be able to withdraw including the grant money. I talked to a childrens education fund sales person and he mentioned that it could be any post-secondary school/university, even outside of Canada, all that’s needed is a note from the institution that proves that the kid is enrolled. Will the government will take back the grants (matched contributions made by the gov) if the kid studies outside of Canada? Also, I’m looking into setting up a TD mutual fund RESP account that i’ll then convert into a TD e-series funds account as is described in another blog entry in this series (http://www.moneysmartsblog.com/resp-how-to-get-started/). Hopefully there’ll be no annual fee. this sounds a bit complicated though, is it to avoid the annual fees? Most banks have a 50$ annual fee for RESP accounts. For example the TD Waterhouse RESP account (their other RESP product) has a 50$ annual fee if you have below $25K in the account. While the child is living in Canada, they are eligible to receive grants on any money contributed to the RESP. If the child moves away from Canada – they can continue to make contributions but can’t get any more grants. They can keep any grants that they earned while residents of Canada. If the child ends up going to post-secondary school in a different country then they can still use the RESP (including grants) for this purpose. They don’t need to attend school in Canada. You need to call the CRA to verify the exact school you want the child to attend. You just need to show proof of enrolment at the school. that lasts at least 13 consecutive weeks. One thing to keep in mind is that the RESP is completely tax sheltered while you are in Canada. This may not be true if you live in a different country. Little Johnny lives in Canada from age 0 to 8. His parents contribute $2500/year for 9 years – total contributions will be $22,500. Total grants received from government will be $4500. Johnny and family moves to Germany in the year he turns 8. At that point they can’t get any more RESP grants. The RESP + grants will continue to exist in Canada – if Johnny goes to post-secondary school In Germany then he can use the RESP money (including grants) for that purpose. 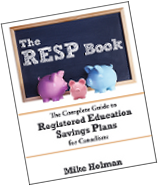 It’s important to note that the government approves the RESP grants – not your financial institution. So don’t get the idea that if you “forget” to tell your financial institution you don’t live in Canada any more they will continue to pay the RESP grants. They won’t. Why convert your TD mutual fund account to eFund account? The main benefit to converting the TD mutual fund account to the eFund account is to be able to buy the TD efund index funds. They are the cheapest index funds around and are the best deal if you are willing to manage the RESP account by yourself without any financial advice. According to the Canadian Capitalist – there are no annual fees on a TD efund RESP so that would be a huge benefit as well. Annual account fees are a bad thing – especially for a smaller account (such as a new RESP). Try to avoid them if possible. Thanks for the mention Mike. Yes, there are no fees for the TD RESP Mutual Fund account. Actually, a TD e-Series account is simply a TD Mutual Fund account set up in some branch in Toronto that allows purchase of e-Series funds. It beats me why a mutual fund account set up at any branch but having online access can’t allow purchase of e-Series funds, but that’s the way it is. My son and I moved to the United States he is still a Canadian citizen. I kept the RESP in Canada and continued to make monthly contributions. It is true that we cannot use any of the grant money?